The Suzuki Vitara has been around longer than the new wave of compact SUV models and while it was liked for being well priced and a competent transporter, the time has come to make style and comfort improvements. The new model certainly has improved lines and the quality of the interior trim has been upgraded, but it’s beneath the bonnet where you will find the best improvements. Boosterjet technology has been installed for the first time and there is the choice of a one-litre 111PS unit or a 1.4-litre 140PS unit, both of which give a better throttle response and fuel consumption figures. The one-litre unit introduced in the Baleno has plenty of punch, offering 170Nm of torque from 2,000rpm to 3,500rpm, and it works well with the five-speed manual or six-speed automatic transmission option which is becoming increasingly popular with the growing number of urban drivers. The 1.4-litre with a six-speed manual transmission is similarly energetic, with 220Nm of torque on tap from just 1,500rpm to 4,000rpm. Suzuki’s boast is that its boosterjet technology gives the same level of power and torque as a 1.8-litre normally aspirated engine. There is also the option of an all-wheel-drive. In common with many other manufacturers, Suzuki is not offering a diesel option as the feeling is the level of demand is falling and that the petrol engines on offer come close to diesel economy without the initial price hike. But there is no talk of all electric models in the immediate future. The driving position is good and boot space generous. Standard equipment on the entry level ST4 includes stop-start, cruise control and speed limiter, automatic air con, electric windows, alloy wheels, Bluetooth connectivity and seven airbags. The SZ-T adds 17in alloy wheels, rear privacy glass, smartphone connectivity and navigation, while the SZ-5 has improved seating material, keyless entry, adaptive cruise control, panoramic sunroof, blind spot monitor, traffic sign recognition and LED headlights. Prices start at €20,995, rising to €24,995. The brand has an excellent reputation for reliability, it is spacious and it is easy to drive. Suzuki is also preparing to join the race to hybrid drive. As well as 12V and 48V mild hybrids, there is a full hybrid Vitara on the way. 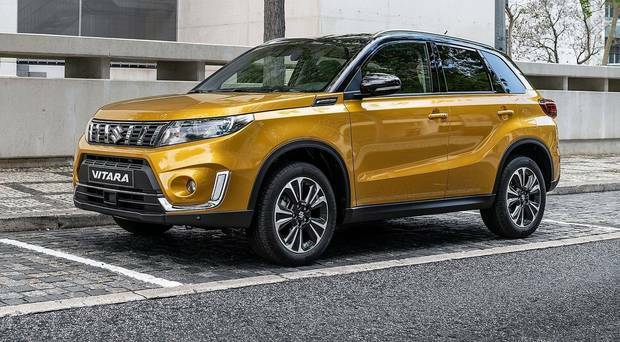 The Vitara will be the firm’s first full hybrid model when it launches early in 2020s. A mild hybrid is available in smaller models but the full hybrid power assistance will only come with the S-Cross and the Vitara.